The future of personal computing is mobile, most commentators would agree. Move your work from the beige box to a laptop and you don't really miss much, save for truly high-octane graphics and large-monitor viewing. Laptop graphics will assuredly remain a step or two behind those found in high-end desktops, though gaming-oriented notebooks, equipped with Radeon and GeForce mobile parts, can provide a decent gaming experience at high-definition settings. Addressing the other shortcoming, Intel has been working hard on enabling technology which replicates laptop-viewable content on to a larger screen or projector. Intel's Wireless Display (WiDi) technology harnesses Sandy Bridge laptops and a wireless link between laptop and screen. Though undeniably promising, a maximum 720p export resolution, content-protection issues, and visually discernible lag hindered first-generation uptake. WiDi v2.1 corrects many of these problems, yet usage still requires a second-generation Core-equipped laptop and Intel HD Graphics. Another method which achieves the same laptop-to-big-screen goal is wireless HDMI, usually powered by WHDI (Wireless Home Digital Interface). 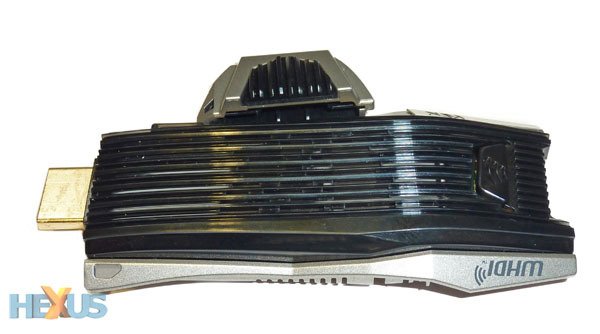 Belkin, HP, ASUS, to name but a few, have all taken WHDI in their stride, and NVIDIA graphics-card partner KFA2 has gone as far as releasing a GeForce GTX 460 with built-in WHDI support. Now bringing WHDI to the masses, KFA2's released the £135 Stream HD - powered by the Amimon chipset - enabling you to stream uncompressed 1080p content from any HDMI device to a large-screen TV or projector. The premise here is to rid your lounge/bedroom/office of various wires, but take one look at the contents and this wireless kit is heavy on cables. There's a USB-key-like transmitter, a larger, though by no means huge, receiver and stand, two HDMI cables, power adapter for the receiver, remote, mains-to-USB adapter and, not shown, a mini-USB-to-USB cable and key-stand. So why so many pieces for what's marketed as a wireless kit? The laptop-side transmitter/dongle plugs directly into an HDMI port and beams the content over to the receiver. However, with the HDMI port providing no power, the receiver has a mini-USB port that can be juiced by either a USB cable from the mains, hence the adapter, or from the laptop itself: we'd go with the latter, assuming ports were available. Fairly chunky in size for a key (107mm x 44mm x 16mm), an HDMI extender cable can be used to keep it out of harm's way. KFA2 also bundles in a dongle stand, keeping the key upright. 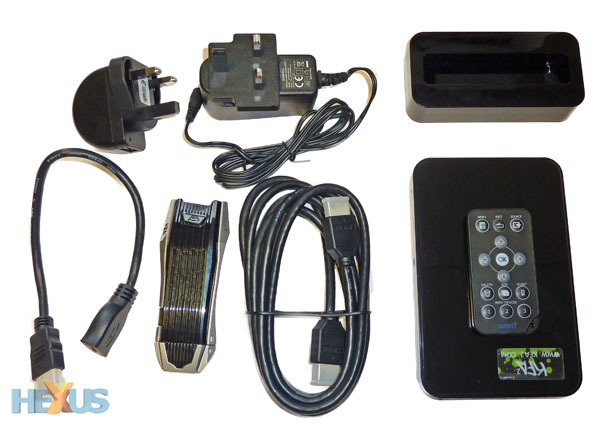 The receiver box, which appears identical to that found on the WHDI graphics card, is powered by the mains adapter - the USB port is 'reserved' - and HDMI acts as the audio/video connection of choice. No extra drivers are required, making setup easier than Intel's WiDi, and you can get up and running within a couple of minutes. 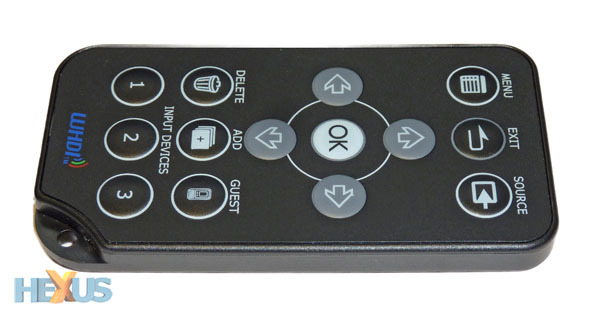 KFA's dongle and receiver are pre-paired at the factory, but one can connect and switch between further dongles, available separately, by using the bundled remote control. KFA2 uses the HDMI v1.3 standard for transmitting (up to) 1080p video and 7.1-channel (LPCM, DTS, Dolby Digital) audio. HDCP 2.0 support means that Blu-ray transfers are just fine, but the HDMI standard employed here falls short of enabling 3D playback, which is a shame. Keeping up with the required bandwidth, Stream HD transmits over the unlicensed 5GHz band and is good for non-line-of-sight coverage of 10m between transmitter and receiver. Reading between the lines, you should be able to view any content on your big-screen TV irrespective of which room your laptop/transmitting device is in.